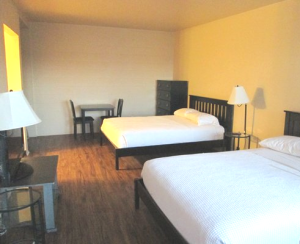 The rooms at Regal Inn have been transformed and restyled to a Boutique motel and refreshed with hygienic bedding and shiny new flooring and window treatments for your clean and comfortable stay. Rest assured on quality plush mattresses with hygenic wrap. Guests enjoy plush new beds with the latest furnishings with a contempo designer style. No standard bedding here, the room is designed with fresh stylish linens to match the new sleek design. Enjoy smooth wood style floors for extra cleanliness from top to bottom. Turn on the big 48 inch flat screen TV and tune into hundreds of TV channels including Showtime, for your home away from home. The spacious rooms come with new tall black dressers with stylish curvy drawers that are large enough for lots of storage. 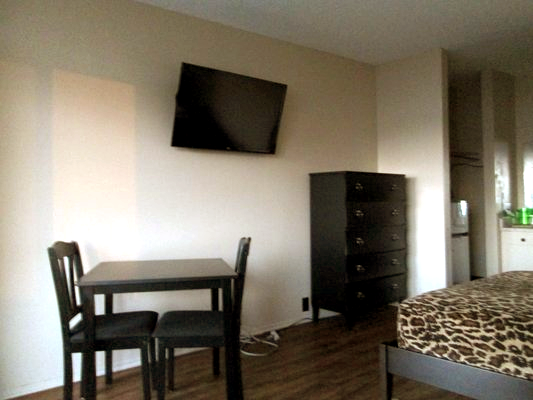 Sleek matching tables and chairs, bed and seating provide a room you can stay in for a night or for an extended stay. The remodeled baths come with thick plush towels. The restyled and refreshed rooms also come with a tall mini-refrigerator and a microwave for preparing your meals, and a table for your in-room dining. No more curtains, we installed sleek window blinds for personal privacy, cleanliness, and style. What has not changed is the friendly inn service that is always in style and speaks volumes of our desire to have you choose Regal Inn in Oxnard as your home away from home.